LuLu Makeup Turns 1! | Vanity and Everything in Between. Hi everyone! LuLu Makeup is turning 1 year old! 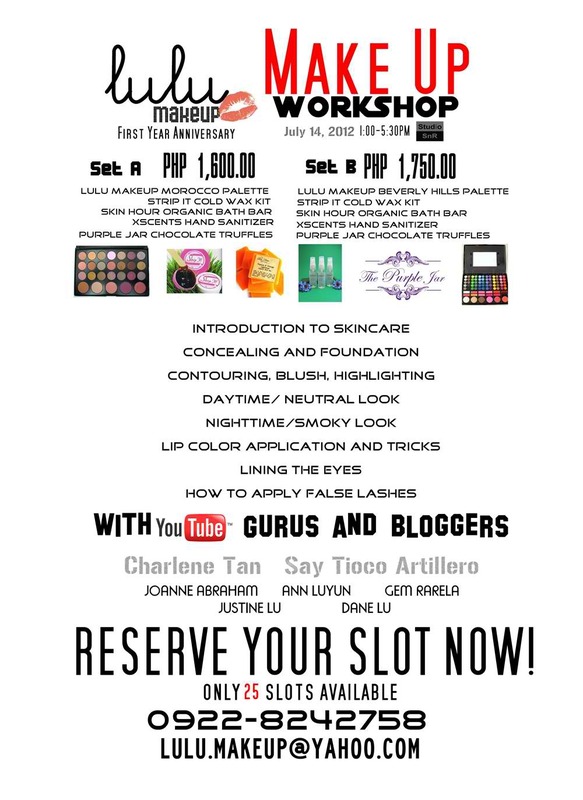 To celebrate our 1st anniversary, we will be conducting a private makeup workshop onJuly 14, 2012. The workshop will be held at Studio SnR located at Unit 301 Millennium Place, 17 Meralco Avenue Ortigas Center Pasig from 1:00-5:30PM. Char and Say will be the instructors for the workshop and demonstrate on LuLu's very own Justine and Dane. LuLu Makeup ambassadors Joanne, Ann and Gem will be present to assist you personally to make sure you get everything perfectly! There will be a booth for LuLu Makeup products at the makeup workshop so if you need other products, you can purchase them on the day itself at a discounted price. How great is that! It's going to be a fun day full of makeup, laughter and pictures and of course we’ll make sure that you'll learn a lot! 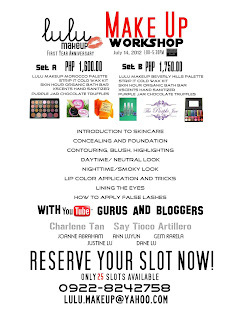 Don't forget to reserve a slot by contacting us at 0922-8242758 or lulu.makeup@yahoo.com. There is only 25 slots available, so hurry and reserve now! USE PROMO CODE GEMLUVSLULU1MAKEUP TO GET A DISCOUNT! *Full payment is required to reserve a slot. *You can get promo codes from the LuLu team and ambassadors' blogs to get P100 off! *Promo code is only valid for transactions until July 5, 2012.